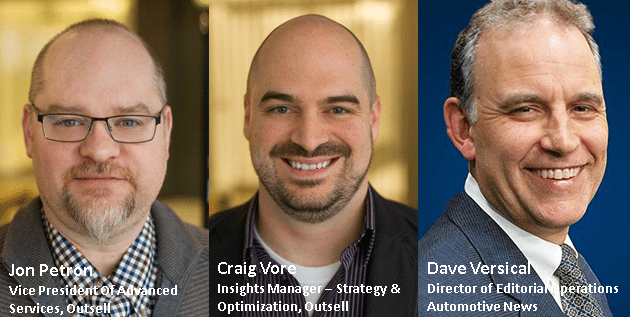 Outsell will sponsor a free one-hour power training webinar hosted by Automotive News on the topic, “Offense Is The Best Defense: Keep Your Customers From Shopping Elsewhere” on Wednesday, June 8, 2016 at 2:00 pm Eastern. Did you know that on average over 46% of customers choose not to come back to a dealership for their next purchase? And 13% of them are buying the same brand sold from another dealership. So what can dealers do to address this? Dealers have the power to prevent their customers from making a purchase elsewhere. And furthermore, some dealers aren’t aware that they already have all the inside data they need to attract additional active shoppers in their area. Predict who’s ready to buy so they can reach out to them before the competition does. Figure out when old leads from years ago begin shopping again. Track a previous customer’s shopping habits to figure out which vehicles, products, and services are most relevant to them. Continuously stay top-of-mind with customers throughout their vehicle’s life cycle.